The DeluxePlus is designed to bring two essential and classic sounds (spring reverb and bias-modulating tremolo) to whatever amp you’re working with. •Spring reverb and bias-modulating tremolo in one small box. •Use each effect individually or together for the true vintage vibe. •Waaayyy more drippy reverb available than your amp can deliver. •Deep, buttery-smooth tremolo that dips ‘n dives like a unicorn-dolphin should. 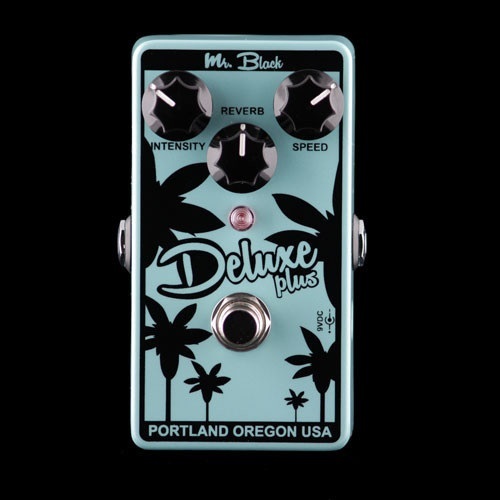 Every Mr. Black pedal is designed and handmade in the rainy pacific-northwest; in the “south-easy” side of Portland, OR.